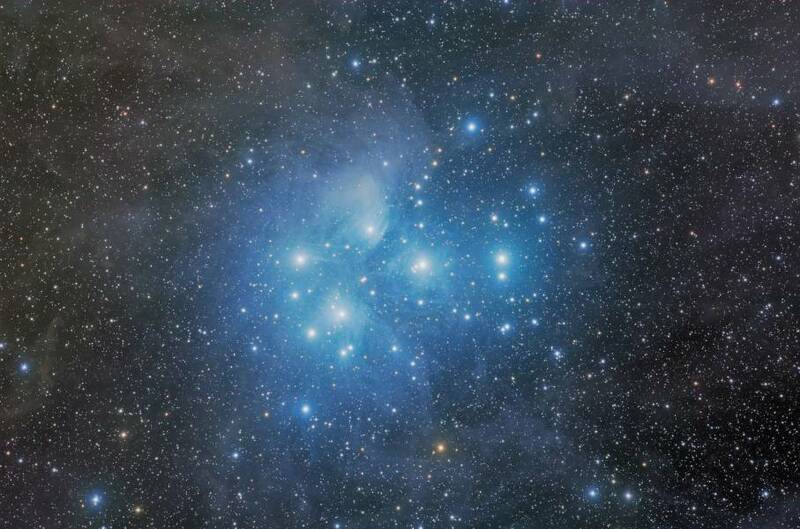 The Pleiades is one of the closest open clusters to our solar system and consequently one of the brightest. At least five or more of its members can be seen from light-polluted skies. This is also one of the most picturesque and most-photographed of the open clusters. Decent images can be taken of this cluster from even light-polluted locations. So why have I never imaged it over my imaging career until 2013, ten years after I started? The biggest factor is that all the cameras I've used prior to shooting this target are non-antiblooming (NABG) cameras. Here is a quick write-up explaining NABG cameras. As bright as the stars are in the Pleiades, I could not shoot this target without filling the chip with hard-to-clean blooms. So, why did I have NABG cameras? Generally speaking, NABG cameras are far more sensitive and generally work better in light-polluted environments (though nowadays many great images are being shot with ABG cameras from light-polluted sites). Now that I am shooting from a dark site, I can use antiblooming (ABG) cameras. This image is my "first-light" image with our first ABG camera, an SBIG STL-11000. I've rendered this target two different ways. As can be seen from the version on the left thumbnail, dust clouds are visible in even this relatively short (by my standards) exposure. I was inspired to see how much more of those dust clouds can be brought out by brightening just those dust clouds, resulting in the image on the right. I like both versions, so I thought I'd present both. Speaking of dust clouds, here is another point of interest about the Pleidaes. 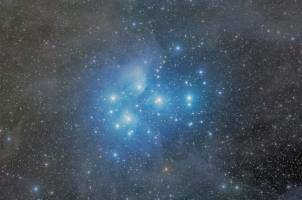 I remember reading an astronomy textbook describing the Pleiades as a very young (cosmically speaking!) star cluster that is just shedding the dust clouds of its youth. The dust clouds referred to are the bright blue shrouds seen enveloping the stars. More recent measurements have shown that the nebula is actually moving in a different direction through space than the stars of the open cluster. It turns out that we are just looking at a beautiful cosmic coincidence! The stars are just passing through the dust cloud, their light reflecting off the dust and making a picturesque cluster even more attractive! Remote Guide Head on a Borg 45ED refractor.